Imagine you’re in the hospital in December, filled with anxiety about your condition and dispirited about being sick, especially during the holidays. A volunteer knocks on the door and has a gift for you. It’s a beautiful calendar for the coming year with vintage maps from Asia to Africa or a calendar of charming old travel posters from Italy. The images make you smile and give you hope for the coming year. You feel better and more positive. And someone cares. 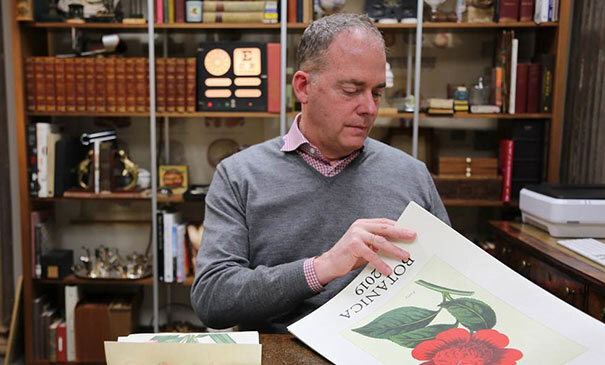 That’s the reason Brad Parberry, founder of Cavallini & Co., donates thousands of the company’s popular wall calendars every year to Virginia Mason. In 2017, Brad gave 2,500 calendars that were distributed during the holidays to patients in the hospital, as well as our volunteers to thank them for their service to Virginia Mason. “It is a wonderful opportunity for our volunteers to lift the spirits of those in the hospital, and to be recognized for their contributions, too,” said Erki Ruubas, supervisor, Volunteer Services. For more than 25 years, Cavallini & Co. has produced the calendars as well as other high-quality stationery products. Images on the products come from the Cavallini archives that include vintage postcards, mid-century travel guides, botanical plates, decals and many more items. Brad began the collection when he was 9 years old and received an envelope of vintage luggage tags in the mail. He grew up with his family in Bellingham, Wash. Inspired by a year spent immersed in the culture and art of Italy, Brad began importing art calendars like the one he first purchased in Perugia. Virginia Mason patients, volunteers, board members and others are fortunate to benefit from the generosity of Brad Parberry. We thank him for the hope and joy he brings.